The T6-1000 is a big step forward in meter technology - one which I'm sure Fluke's competitors will have to chase. Every trade has its hazards – it’s why tradesmen get paid the big bucks, right? Well, maybe not. In any event, the electrical trade probably has the most invisible hazards of them all. 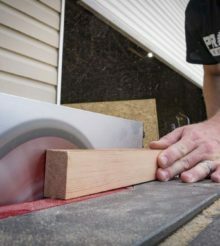 Carpenters can see a spinning blade might cause injury. It’s clear to plumbers why wastewater is detrimental to their health. But is that line live? Does that service panel have loose or corroded connections? It’s never immediately clear. You usually have to make physical contact with wires to find out. Of course, it’s always wise to de-energize. I might have made a new catchphrase just then. We like tools that can put as much space between us and the danger as possible. Flir’s contributions to infrared technology can’t be understated. Even still, infrared can’t measure current. So to come across a measuring device that still keeps you safe – well, Pros are all ears. That’s the promise of the new Fluke T6-1000 Electrical Tester. How so? Fluke claims that for the first time in the history of the trade, Electricians can measure up to 1000V through the tool’s open fork without removing covers or loosening wire nuts. I’m listening! The Fluke brand name is enough of a selling proposition for most electrical Pros – and with good reason since the company makes solid products. But the novel selling proposition of the T6 – an industry first – is its ability to display both voltage and current simultaneously. And that’s not all. It shows these power supply measurements without making contact to live voltage. Using its 17.8mm open fork it can measure up to 1000V AC, 200A, 1 Ω to 100 kΩ, and 45 Hz to 66 Hz on 4/0 wires. It’s a true-RMS (Root Mean Square) meter, measuring both sinusoidal and nonsinusoidal waveforms by converting AC waveforms into their DC equivalents. In addition to the open fork design, you’ll notice a clean, uncluttered interface and a shape similar to your regular meter. Front and off-center is the function selection dial that switches among power on/off, voltage auto select, FieldSense, and resistance. The meter has an automatic shutoff after 15 minutes. Two small ridges just below the open fork create a finger guard for safe operation. There’s a hazardous voltage warning light indicator for 30V, a button that toggles the backlit display, a yellow button that displays Hz in FieldSense mode, and Hold button that temporarily freezes the display. The test probe docking stations are on the back of the unit – nothing special there – but between the stations is a curious area labeled Ground Contact. It’s this Ground Contact that is designed to allow FieldSense to work its magic. We’ll see just how it does that in the Performance section. All this fancy technology doesn’t mean a hoot if you can’t clearly see the measurement readings. For that purpose, the Fluke T6-1000 Electrical Tester has a large digital, backlit display that boldly shows both Volts and Amps in FieldSense Mode. What’s more: the backlit display turns green when it gives you a valid measurement. It seems like Fluke has really designed this to make our jobs easier! The whole package weighs in at 0.78 pounds and runs on 2AA batteries. Fluke estimates that you’ll get about 200 hours of operation running on them. The test leads have removable 4mm probe caps and the unit accepts the optional Fluke TPAK Magnetic Meter Hanger. The company backs up the tool with a standard 2-year warranty extendable to 4 years through product registration within 45 days of purchase. There are two ways to take measurements with FieldSense and, of course, neither of them require a test lead to come in contact with live current. The first way, however, does require the black test probe to be used as a ground. Set the Fluke T6-1000 Electrical Tester to FieldSense with the Function Selection dial. Touch the probe to the neutral and slip the hot wire into the open fork, keeping all fingers below the finger guard. The backlit display turns green with a valid measurement. Press hold to keep the display reading on the screen temporarily or press the yellow button for Hz. You don’t have to take any splices apart. You don’t have to shove the lead up into a wire nut. It’s safer and that’s pretty cool. Fluke suggests using this method if you’re wearing a glove or insulated footwear, standing on an insulated ladder, or additional ground contact is needed for the application. One caveat here: although you can touch the black test lead to any ground, the Fluke T6-1000 Electrical Tester won’t tell you if you’re running with an open neutral unless you’re touching actual neutral. I did this by opening up a neutral in my own house to see what it would do. Don’t get me wrong – measuring voltage without touching live current by touching the black lead to any ground is still awesome. The neutral indication, or lack thereof, is just something to keep in mind. I tested the open fork’s accuracy/consistency by using the test leads to measure in the traditional way. The open fork method is spot on. The second way – and even easier in theory – is to essentially make yourself the groud using the Ground Contact area on the back of the unit. Both probes can remain docked for this process. Again, slip the open fork around the wire being measured and this time, firmly press Ground Contact. The display should again turn green as it gives you a valid measurement. If no icon appears in the upper left corner, the display remains grey, and no VAC measurement registers (in other words, you’re grounded properly but there’s no reading), then the measurement is less than 16V and/or the wire’s not properly running through the fork. It can difficult with shorter or smaller wires to touch ground and keep the wires in the fork simultaneously. You can still use Method 1 in those cases. During a recent job at a car dealership, I had to determine what breaker needed replacement. There were ten specialty 80A breakers in the panel – none of them were off or tripped – they all appeared to be on. Using the Fluke T6-1000 Electrical Tester’s open fork, I was able to see how many volts and amps each breaker was pulling much more quickly and safely than I could with a traditional meter. I simply put the open fork around each wire until I found the one that wasn’t carrying any current at all. The test lead cords wrap up nicely. I can hang the meter by the wrapped cords on a hook in the truck. Most meters don’t have a way to be hung is really a pet peeve, so bonus points to the Fluke T6-1000 Electrical Tester. It would be great if the black test lead was interchangeable with an alligator clip for ground attachment. And I hope that the next generation is Bluetooth capable so that I can see a dynamic graph of inrush, voltage drops, overamping, underamping, and so on. The Southwire Clamp Meter I reviewed a while back had this capability and it’s very helpful. The Fluke T6-1000 Electrical Tester is a significant step forward in meter technology. I think this meter will have other companies scrambling to catch up. It truly is safer and quicker to use this meter with its open fork than to touch a test lead to any live current. But you have to expect some limitations with a first generation meter like this. Keep in mind the open neutral issue – you have to touch the test lead to neutral and not just ground it to know if neutral is open or not. And Fluke really can make the Ground Contact method a little more foolproof. Overall, though, for this meter’s capabilities, it has good performance for a first generation meter and is fairly priced at $225. Where is the t6-1000 made? Give it a year or so for Fluke to work out the kinks.